Thinking of giving your dining room a makeover? 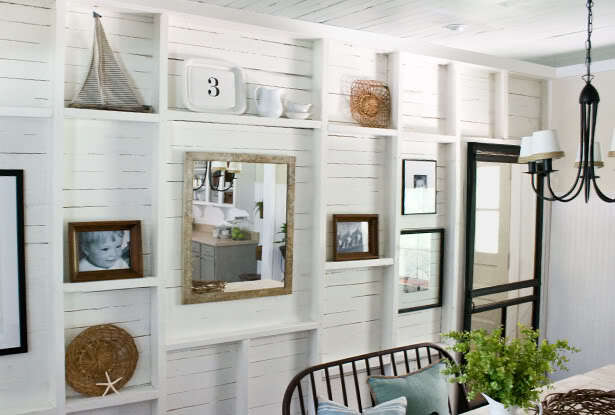 Searching for dining room wall décor ideas? 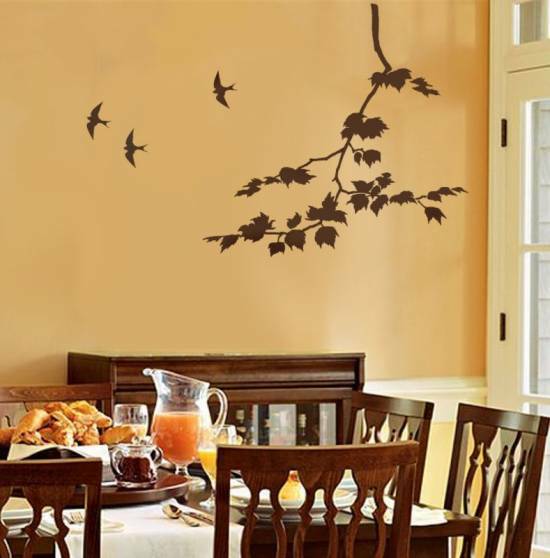 Well look no further, we have lined up few of the best ideas for decorating your dining room walls. 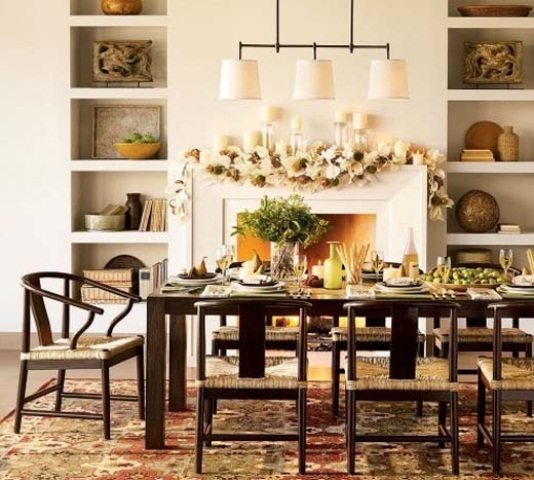 Dining room decor greatly depends upon the taste of the person living in a particular home. It all really comes down to what an individual prefers. Whether they like eating in a comfy and warm space, or whether they prefer entertaining big time and having loads of people over for lunch or dinner. Some people might prefer ostentation above all things, others a more comfy look. Whatever dining room décor a person chooses, it must be the sort which appears welcoming. Take a look at the 15 ultimate dining room wall décor ideas. 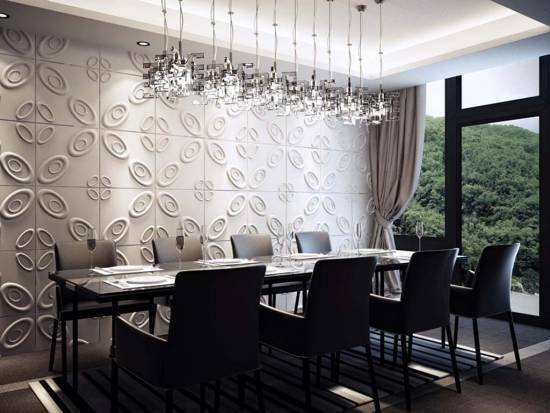 This lovely dining room wall with its accented look and textured background looks cool and trendy. For those who prefer a modern touch to their homes, it’s an ideal choice. The mounted lights on the wall add to its glamorous appeal and when lighted make the whole room look elegant and chic. This extremely stylish dining room wall accented with antique board give a massive appeal to this room. Also take a look at the classy chandelier which gives the room a look of lavishness. For those willing to indulge in a fantasy of extravagance this room is certainly a treat for the eyes. 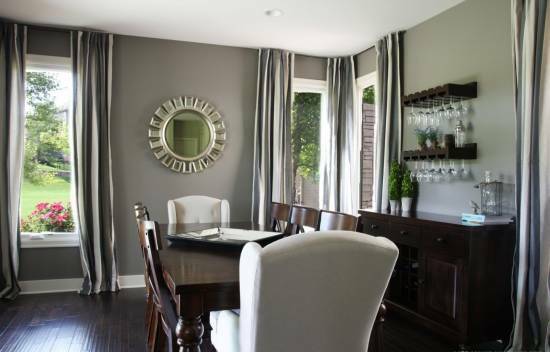 This elegant and chic dining room with its gray painted wall is sophisticated and completely up market. Check out how the varieties of glasses, glass bottles and small pots are kept in those floating shelves. It creates a stunning display console, which is innovative and cool. 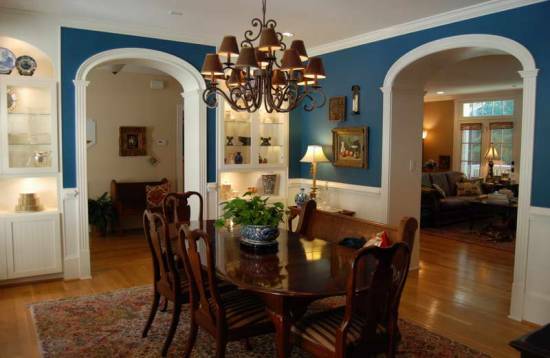 This inviting and homely dining room with its blue walls epitomizes the warmth of the Mediterranean influence. It not only looks snug but also comfy. Try painting your dining room walls with bright shades of blue, add in a few pictures on the walls and see the complete transformation of the room. 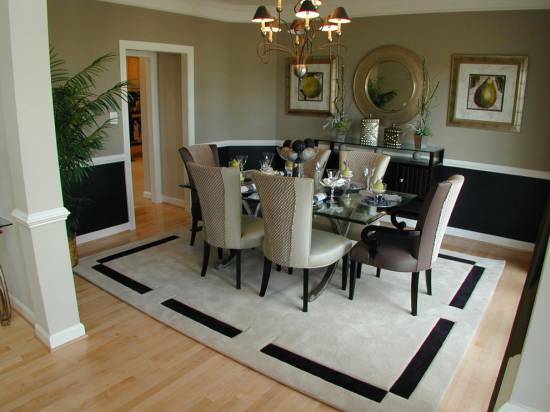 This dining room epitomizes class and luxury. 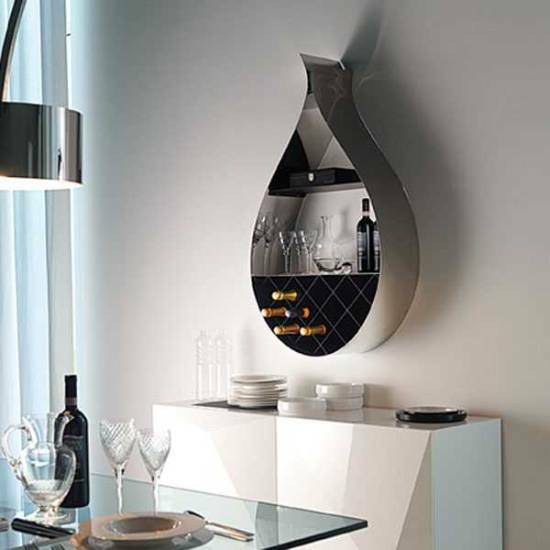 Check out the opulence created by the magnificent mirror mounted on the wall. It completely changes the look of the whole room, making it appear bigger than it actually is. This kind of dining room wall decoration is definitely not for the faint hearted. However those who are willing to experiment with boldness can add a mural on one of their dining room walls. The pictures on the murals may range from those of nature to those of individuals. The idea is to simply experiment and be creative. 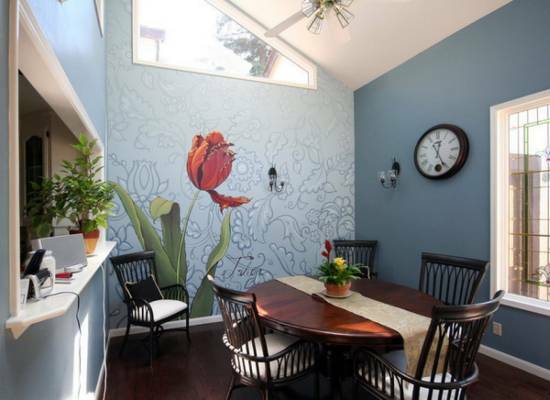 One look at the stenciled wall of this quaint little dining room and you simply can’t help adoring it. The stark simplicity of the dining room furniture is made all the more endearing because of the lovely stenciled pattern on the wall. For those looking to make a change albeit one which won’t break the bank, this is a great dining room wall decoration idea. This plain white colored dining room wall is made all the more attractive by the presence of the stylish wine rack mounted on it. It gives the room a modern and innovative look. Try looking for similar pieces to add character to your dining room wall decorations. 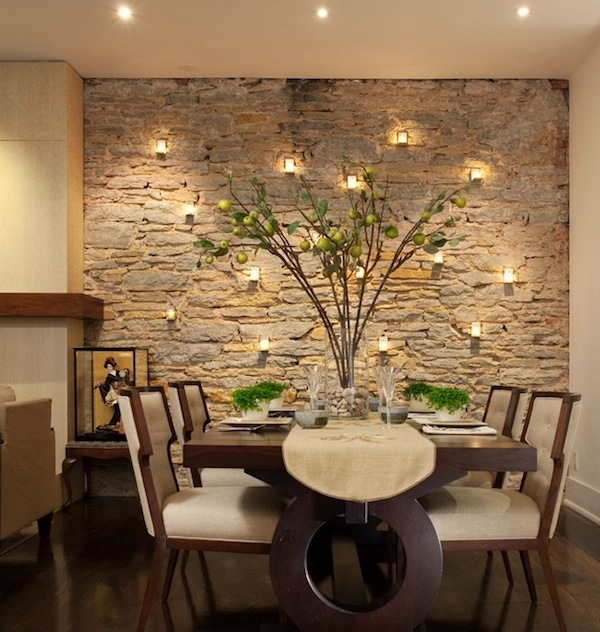 The unusual look of this dining room wall is unlike anything you might have seen before. It is made all the more distinctive by the presence of the minimalist dining room furniture. However the end result is a room which is stark yet also unique. For those looking to experiment with something diverse this is a good idea. For those looking to decorate small dining rooms in an unusual or unique way can take inspiration from this picture. The amazing wall paper makes the whole room pop with an aura of distinctiveness. The hanging chandelier gives it a final flourish! 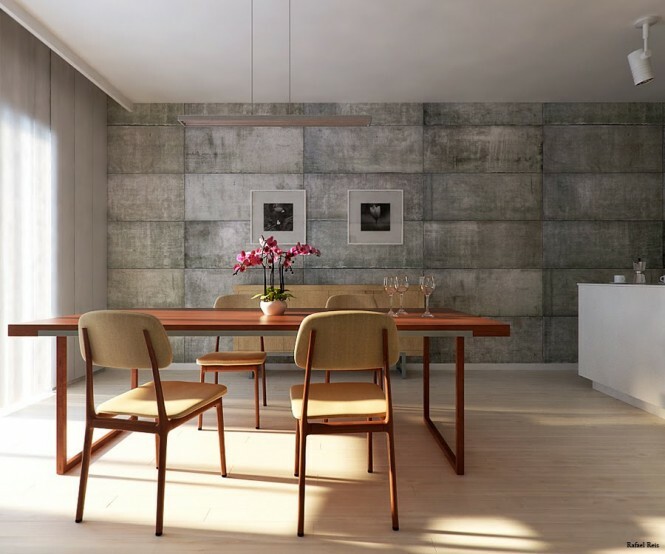 The textured wall of this dining room is made all the more endearing because of the presence of the personal photographs mounted on the walls. It gives the room an engaging and attractive look and is a great way of displaying family pictures for everyone to see. Check out the fireplace attached to the dining room wall, it gives the room a comfortable and welcoming look. Also notice how the shelves in the walls are used to display different show pieces, a smart and innovative idea which is sure to appeal to those who like indulging in their aesthetic side. The stark walls of this dining room create a visually stunning effect and are great for those who love the minimalistic look in their home decors. Notice how the wall is kept bare except those two framed paintings which demonstrate the starkness even more. The marbled wall with its innovative wall fireplace adds a certain modern touch to this dining room. It also adds to the luxurious feel and when paired with the customized wooden flooring and classy chandelier make the room look dazzling! The magnificent opulence created by the stunning wall decorations evokes a look of indulgent luxury. 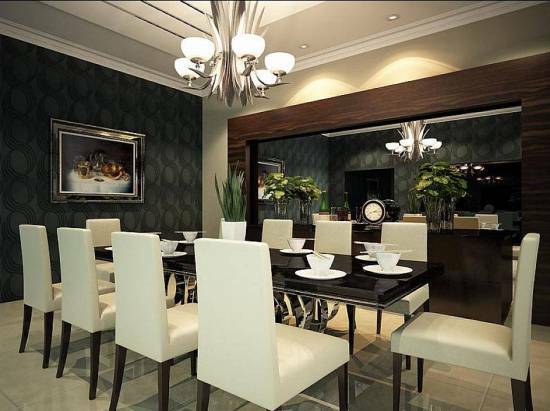 The oval mirror and the glass show case attached to the wall bring out the very best in this dining room. For those who prefer to entertain with style this visually stunning room is indeed something to take inspiration from. Decorating dining room walls requires careful attention to detailing. A simple alteration in the texture of the wall by adding faux paint or a few pictures or show pieces can completely modify your dining room. Take inspiration from some of the above mentioned ideas and get creative while decorating your own dining room walls!